There are run of the mill slimy politicians, and then there are politicians whose sliminess is so exceptional, it elevates them into a premier league of sleaze. 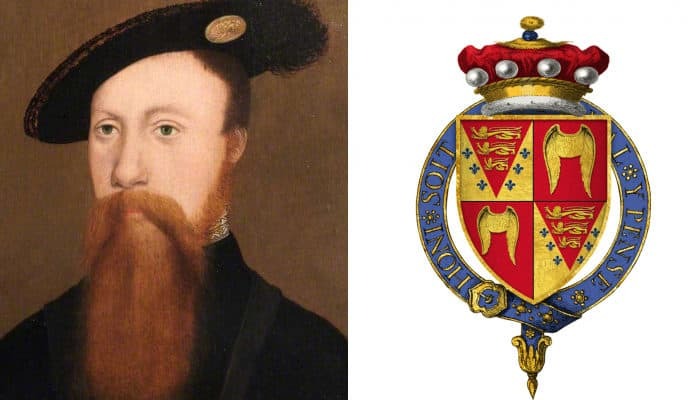 The ranks of the super sleazy must include Thomas Seymour, 1st Baron Seymour of Sudeley – a Tudor era courtier from the reigns of kings Henry VIII and Edward VI. Among his highlights – or lowlights – were pimping out his sister to a king, sexually molesting a 13 year old princess living in his house, and killing an 11 year old boy’s dog during a botched attempt to kidnap the child. Following are forty fascinating and/or significant facts about the life and career of the Tudor era’s sketchiest courtier. Born circa 1508, Thomas Seymour was the fourth son of a knigh, Sir John Seymour, of Wolf Hall, in Wiltshire, southwest England, who traced his origins back to William the Conqueror’s 11th century Normans. Sir John was not of the high nobility, but a relatively minor member of the country gentry, so Thomas and his siblings had to make something of themselves, rather than have it made for them by an established sire. Little is known about Thomas’ childhood and education, and he first appears in the historic record in the 1530s, as a messenger in service to his cousin Francis Bryan, king Henry VIII’s ambassador to the French court.